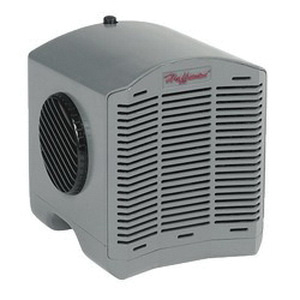 Hoffman Thermoelectric Dehumidifier removes moisture from the air within an enclosure/standing liquid and protects the electronic as well as electrical components from condensation. It features high impact ABS shell construction and reduces corrosion that limits the life of internal electrical and electronic components. It has a dimension of 5.50-Inch x 6-Inch x 5.75-Inch. The screw mount dehumidifier mounts via DIN-rail on internal panel or mounts directly onto the inside bottom of enclosure. The dehumidifier removes 8 oz of moisture in 24 hours and is perfect use in mild steel, aluminum, stainless steel and non-metallic enclosures. It contains 4-ft plastic hose, two hose retainers, one double-ended hose retainer, 6-Inch of Velcro®, 7-Inch strip DIN-rail and two mounting screws. Dehumidifier is UL/cUL listed, CE/CSA certified, NEMA compliant and meets IEC standards.